I think a longer bridle is ideal but not 100% necessary. My vote for most helpful mod is the stowless/semi-stowless bag. What other manufacturer's canopy can Echo be compared to? It is more like a Sabre or Crossfire or Katana? The card is not only a possible starting point for a search, it is a SYMBOL of Cooper. Come on...you don't really think we set all this up just to do a search, do you? Frankly, we give any search done at Castle Rock far less than one percent of a chance of actually finding anything. In fact, although the search itself will be fun, it's more of a sideline in some ways to the real idea here. Your next question might be...then WHY bother searching there? Well, it's like what that guy said when he was asked why he was going to climb Mt. Everest: 'Because it's there.' The Castle Rock Search/Campout is more aimed as being a gathering of Cooper fans, both old and new, along with a few experts. We can only look around with those metal detectors during the day. It's also supposed to be fun, and to help promote Cooper with the general public. Interaction and camaraderie. After 48 years, you have to do these sorts of things to keep Cooper in the public eye. This isn't the first time AB of Seattle has done this sort of thing, either. We've sponsored three previous Cooper Campouts. The only differences between those campouts and this one, is that there is a day search involved, and we're going to do some media related to the Cooper case. The main object for everyone is to have FUN...and I can guarantee they certainly will. EDIT: Not to be picky there Shutter, but a couple of days ago you were all in favor of Eric going around a locked gate to the same area, and hiking in five or six miles each way to get pictures. Not a problem...however...don't you think the people involved in all of this in June should get equal time in the same area? I have sent two messages to Eric inviting him along on the campout. He is the guy allegedly organizing the next Cooper convention in Portland. He could not only get his pictures, but interact with the public, which might be a good thing for someone trying to get a bunch of people to show up for a convention on Black Friday shopping weekend. Just saying. No answer to our invites yet, but we're hoping. 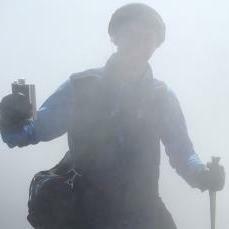 He could even do both, hiking in for pictures, and then driving to the site later in June. Some people that would probably attend his 2019 convention will be in on the campout, and public relations is always a good idea. That letter states that Hayden supplied two chutes to NorthWest Airlines, it does not state that they both went to Cooper. That Detlor letter does not conflict with Cooper using one of Cossey's chutes. Front-mount reserves not having pilot chutes would be consistent for that era. But the only way "E" makes sense is if that second chute described is the pilot chute, but 24 inches, not feet. Could it have been opened later for inspection by the FBI, and that info added to the report? I don't have a problem with searching anything. what I'm telling you is the card will land completely away from any other heavy objects thrown out the back. just seconds between tossing anything is a large distance between the two. then not knowing if the location is the same from 1971. factors like these probably stopped the FBI from searching the area. if Cooper tore the placard off in anger he would of tossed it on the stairs, especially if he was right handed. If the card actually drifted for miles the container wouldn't. it's hard to even figure out when and if he tossed the container out. it just wouldn't land near the placard. the container has two clips on it that attached to the D rings that were missing. ....think about that for a while. If he asked for the chutes and never intended on using them. they should still be there, just like the other chute he discarded. he tore one up and didn't toss that either. what would be the purpose of tossing one out of 3 remaining chutes? if he was as smart as McCoy. he would of tossed them all. leaving nothing behind. Too bad about the butts, yes. But I don't think I will completely buy into the other things. Of course he threw out the dummy reserve. It couldn't be attached to anything and was not found on board. You don't have all the details on the bomb and case, so that is speculation. Why don't we turn the guys with the metal detectors and pointers loose and see if they come up with anything. The placard find location is just a good a place to start as any. Sure, chances are pretty low we will actually find anything, but that's not the total point of the campout. Everyone knows it's NOT just a search. We're talking about camaraderie with Cooper fans, some of them very young or new, video for YouTube, a podcast, a big BBQ. If it were just about a search, I would be lucky to get five people. We're up to fifteen as of today, with six weeks left to the cutoff date for apps to attend. Today, I did something I haven't done since AB of Seattle went live on the internet in August 2006: I modified the top of our homepage to advertise this event, and linked to the introductory video. This shows how serious we are about this event. Oooh, I like these risers! I have had a toggle knot from pulling through the excess line and now I do a ridiculous weave to secure my brake line loop. Big canopy, long excess. I wonder if I can get them to make me pilgrim hat grommet stops for standard width risers. I know an experienced WS jumper who went straight to reserve on a jump as he could not get to his main. He was demoing a large race suit, he took it too steep and he lost control of it. He got spun up pretty fast, felt like he was going to pass out and he was unable to get to his main so he went to his reserve before he passed out. I know of another case where someone went straight to reserve because he couldent pull his main. 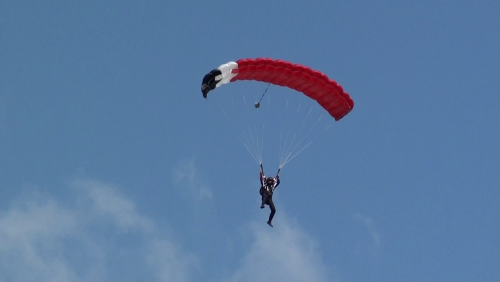 However, he had about 10 WS jumps and just switched to a freefly handle without trying it out on the ground. He dident know how to deploy the freefly pud and so he couldent get it out. I just recently got my 104. Love it! All black Vector 3 container All black PD Spectre 170 main PD reserve PR-160 Vigil II AAD (date of manufacture is 2009, so at the end of its advertised life) Love this system but I haven’t been able to jump much the past couple years so it’s time to let it go. Purchased in 2011. Prior owner bought this rig for wingsuiting. I used it for fun jumping and competing in belly flying at the USPA collegiates. I put about 100 jumps on this rig and it flies beautifully. I added a pillow handle to replace the D-ring. 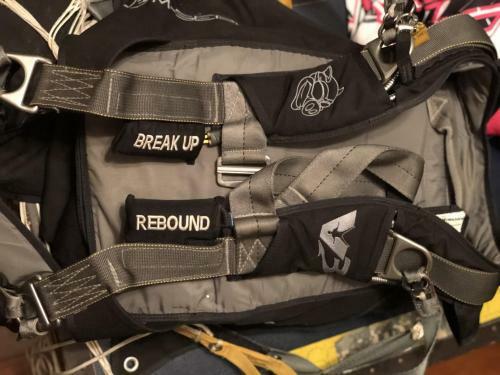 Custom stitching on the pillow handles says “break up” on the cutaway and “rebound” on the reserve. Recommended height 5’7”-6’2” (I’m 5’7”, 150lbs and it fits great). Rig has about 300 jumps on it. Needs a repack on the reserve, then it’s all yours to make some skydiving memories! I hope this rig finds a great skydiver who will actually get to enjoy it! Willing to toss in my Alti2 digital altimeter and 2 pairs of skydiving goggles as well! Bobby Smith let me jump his Strato Flyer at Perris in 1980. The opening and landing were both _Rock hard_ and we were both little guys. I had a ton of respect for him after that jump!! >But remember I can think of only two.properly constructed harnesses that have failed in my 40 year career. Councilman, was it the stitching that failed or the actual webbing? If the webbing, type 7 or 8? Anything noteworthy you can recall?? Thanks!